Through careful planning and coordination, Herman Goldner ensured that eight new Marley NC cooling towers were successfully placed in a downtown Philadelphia office building on schedule and in time for occupants to keep cool as temperatures rose outside. When the Centre Square commercial office complex needed a new cooling tower system, HVAC contractor Herman Goldner Co., Inc. turned to SPX Cooling Technologies to address the building needs, then brought in Erickson Incorporated to conquer the formidable challenge of installing the system in a busy, urban site. Located in the heart of Philadelphia at 1500 Market Street, the Centre Square buildings, at 417’ and 490’, were too tall for the use of a traditional crane, and the extended road closures and weights associated with a tower crane were prohibitive. The existing Marley field-erected cooling tower was decommissioned and demolished in December 2017, and the project schedule required the new system to be online for the start of cooling season; therefore, knock down delivery and assembly was also eliminated as an option due to sheer material volume and potential weather delays. The original 6,000-ton capacity tower was constructed from wood and fieldbuilt in place before the building was completed in 1973. Still in use until its demolition, the tower had reliably serviced the building’s cooling system for 44 years. conditions. With 5,000 tons of cooling capacity, compared with the 6,000 of the original 1973 cooling tower, the new tower saved costs by reducing capital equipment expenditures and field installation labor. Additionally, the final design provides the building with built-in redundancy and extra capacity for future expansion. The decision to select a crossflow-style tower as opposed to a counterflow tower was primarily driven by reduced winter cooling loads, requiring variable flow conditions across the towers. Faced with the high-traffic location and aggressive schedule, a helicopter pick, although challenging, was the best solution to set the eight modules of the four-cell Marley NC cooling tower. Erickson was selected to safely pick and set the cooling tower. efficiently dismantled and brought down a freight elevator for disposal. At the same time, a temporary bypass cooling system had to be devised to provide limited cooling while the final tower cell was demolished. Next, the logistics of delivery, including weights and timing of a helicopter lift, had to be coordinated. “Fortunately, the days selected were bright and sunny, and the lifts went off without a hitch,” said Bob McCracken, Herman Goldner senior account executive. 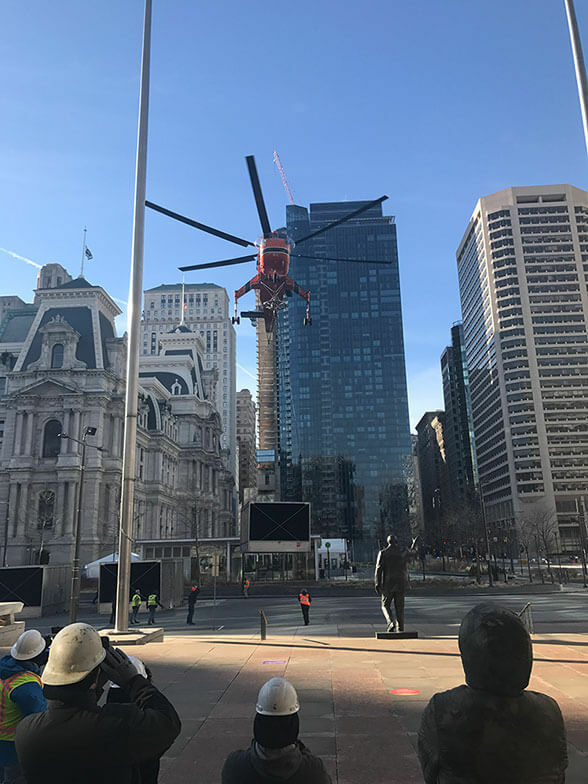 In the case of this particular installation, the Philadelphia Eagles’ two playoff games in January 2018 had to be considered, as lifts like this one require street closures and traffic diversion in the area during the delivery window. Ultimately, Erickson set all eight units in under two-and-a-half hours. The successful and timely delivery was the result of thorough planning and execution by the Goldner team. Prefabrication of the structural steel framing, catwalks, and piping enabled them to prepare the installation site for the new towers prior to setting them. With careful planning, the demolition, lifts, and installation were not only successful, but also safe for all involved. Helicopter installations, when permitted by municipal authorities, can be a cost-effective solution for new cooling tower systems on tall and inaccessible commercial buildings. Careful planning (start to finish, with contingency plans) by the HVAC contractor from predemolition through commissioning can make for a successful, timely, and safe project. Crossflow cooling towers configured with “variable flow” nozzles can provide a more robust turndown for reduced-load conditions than pressurized distribution-style counterflow cooling towers. 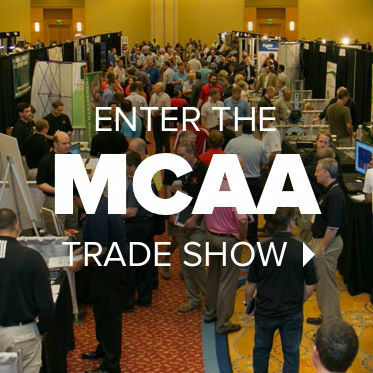 Exemplary teamwork and collaboration among the HVAC contractors, engineers, vendors, various trades, and building owners can keep a complex installation safe, on schedule, and on budget. For more information, visit http://spxcooling.com.